A snappy, witty adventure caper about art, love, death and everything in between. Gabrielle Williams has three kids, one husband and a dog. She is the author of the critically acclaimed Beatle Meets Destiny (shortlisted for the Prime Minister's Literary Awards and Victorian Premier's Literary Awards in 2010) and The Reluctant Hallelujah (shortlisted for the Gold Inky Award 2012) and has been described by The Age reviewer Cameron Woodhead as 'one of the funniest young adult fiction authors around'. As part of her research for The Guy, the Girl, the Artist and His Ex, Gab interviewed a number of people - some of who may or may not have been the actual Australian Cultural Terrorists. The Girl, Rafi is a teenager who moved to Melbourne from Bolivia after the drowning death of her younger brother. The Guy is a Year 12 student from a privileged background who is finding it hard to take school, or life in general seriously. The Ex, Penny, a young single mother is still desperately in love with the father of her child, the selfish and irredeemable Artist, Luke. Luke also happens to be complicit in the theft of Picasso's The Weeping Woman from The National Gallery of Victoria. The four stories of the title characters collide on the night that one of them makes a spur of the moment decision which nearly ends in tragedy. It sometimes seems that the more things change, the more they stay the same. Although this novel is set in Melbourne in 1986, and the music and fashions have changed, society is still grappling with the same issues. Girls and women in general basing their self-worth on their desirability and continue devoting themselves to uncaring men. Mental illness is still sometimes seen as something shameful that needs to be hidden away. Greed, consumerism and consumption are running rampant. Teenagers high on hormones, life and alcohol and under the influence of peer pressure making poor choices with devastating consequences. Although this story is fairly enjoyable, light read, it did seem to me that the women in this story are the ones who tend to suffer the most. Rafi especially was the most affected by her one bad decision, whilst the men generally get off scot free, or were hailed as heroes. I’m not sure what kind of message this is sending out, or whether I am reading too much into this book, but I found the treatment of some of the subjects superficial; going for cheap laughs rather than substance. However YAs may find a lot to relate to in this mostly engaging book; the pressure of high school and fitting in, the spur of the moment choices we make and their long term ramifications would be good talking points. The zeitgeist of Melbourne in the 1980's is depicted in all its excess, colour and grunginess, and the novel captures an interesting period in history. Williams has used the theft of a Picasso, The Weeping Woman, from the National Gallery of Victoria in 1986 as the peg to display the intertwined lives of four people, one making her way to a party at Guy’s place in South Yarra when his parents are away for the weekend. Guy is persuaded by his friends to hold a party and the reader knows that the outcome will be quite different from that expected. 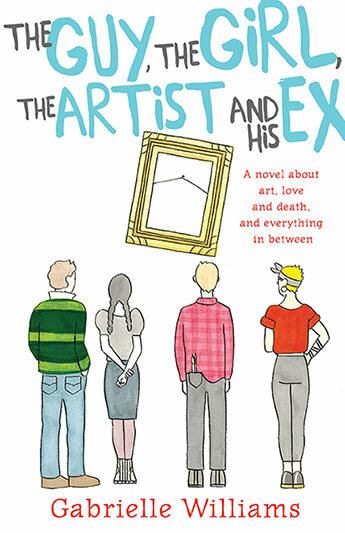 In the meantime, the artist, Luke, an arrogant, self-opinionated man who has made it on the art scene in Melbourne, has hooked up with two others, a disgruntled struggling artist, Dipper, who works at the National Gallery of Victoria, and an older man, Real, an art dealer with dangerous ideas about people being shocked into giving more funding to The Arts. Together the three achieve the impossible and steal the painting. Luke’s ex, a young woman called Penny left with his child, struggles to stop herself being the demanding ex, the crying rejected lover, the one who will do anything to get him back. She has taken a flat in a building owned by a family whose sister has been brought to Australia from South America after the drowning of her son and the subsequent abandonment by her husband. She is convinced she is cursed. Her daughter, Rafi babysits Penny’s baby but one night when Rafi is asked to go to a party by her best friend, asks her mother to look after the baby. The stage is set for a shocking incident which brings all the groups together. This is an amazing story. I was simply gobsmacked by the author’s ability making this frightening incident such a core piece of the story, her handling of it made me immediately reread it to make sure I had all the facts in my head before proceeding. I was absolutely sure that there could be no coming back after such a thing happening and read on with anticipation to see how it was all resolved. Sometimes darkly funny, sometimes confronting, Williams seems to take the readers along her path with ease. I was never in doubt about any of their motives. I loved Penny with her thought bubbles about being independent but then so dependent on any scrap thrown her by the appalling Luke: Rafi, trying so hard to study with a mother beset by strange behaviours: Dipper’s angst and Luke’s cavalier attitude to everything. All the characters are most recognisable, the mother with her descent into mental illness convinced that the horse headed woman has followed her from South America, the men with motives which superficially seem altruistic, but with an ulterior motive, and Guy, so easily led by peer pressure. The novel is divided into three sections, before the party, the party and the aftermath and the chapters are from the perspectives of each of the four title characters. I can see this as a class set as it brings in so many issues begging to be discussed: mental illness, peer pressure, single parenthood, relationships, art funding, and the role of art galleries.